The Messina is a fitness/exercise pool. At 1.5m (5 feet) deep it is a little deeper than the Portofino and has 1 additional Maelstrom™ jet. That is a total of 4 Maelstrom™ wide arc water resistance fitness jets and 5 pumps and is a very powerful class leading aquatic swim gym. There is also the added benefit of a cool down lounger/sunbathing deck built at one end to which either an optional extra deck cushion or teak deck board can be added. CARBON OFFSET CERTIFICATE – Paid By Shoreline Hydrotherapy™ For 20 Years. Lighting – ShoreLight™ Low Energy Multicoloured LED Light. LED perimeter lighting (cost option). 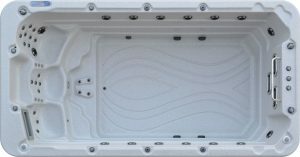 Shell Construction – ShoreCast™ Acrylic. Microban. Ergonomic Design. Strong, Durable, High Lustre Finish. Shell Colour – Sterling Marble (standard). Optional Colours – Navy, White Pearlescent & Sahara. Cabinet Type – WeatherGuard™ Wipe Clean, Low Maintenance, Durable Finish. Cabinet Colour – Charcoal (standard) or Chocolate (cost option). Pedestal Base – RhinoBase™ Premium Resin Base. Tough, Rodent/Moisture Proof. Support System – ShoreSupport™ Stainless Steel Hull Support Cradle. Music System (cost option) – ShoreSound™ Pioneer Premium Sound with CD, Radio, iPod Dock & Subwoofer. Hydrotherapy Massage Jets – Hydropro™ Stainless Steel Hydrotherapy. Jets. Unique Design, Deep Tissue Massage. Water Resistance/Exercise Jets – Maelstrom™ Wide Arc Jets. Control System – ShoreSet™ Balboa® Easy To Use. Programmable. Pump 2 – Whisperhiflo® Hydrotherapy Boost Pump. 230-260 Gallons Per Minute. Massage Pump. Pump 3 – Whisperhiflo® Hydrotherapy Boost Pump. 230-260 Gallons Per Minute. Massage Pump. Pump 4 – Whisperhiflo® Hydrotherapy Boost Pump. 230-260 Gallons Per Minute. Massage Pump. Pump 5 – Whisperhiflo® Hydrotherapy Boost Pump. 230-260 Gallons Per Minute. Massage Pump. Insulated Cover – Thermal blanket (standard). Heatlok™ Cover (cost option). Filtration – ShoreClean™ 24 Hour Water Purification System. Incorporating ShoreClear™ Corona Discharge Ozone Generator Complete with Mezzei® Injector and ShoreClean™ Microfilter.